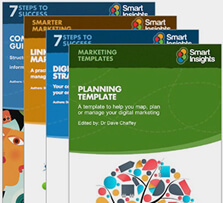 Free members of Smart Insights can access these free sample resources developed by our Expert commentators and edited by bestselling digital marketing author, Dr. Dave Chaffey. We hope you find these resources useful. Any questions or comments, do let us know via our member support. Expert (Pro) members benefit from our in-depth ebooks, templates and training courses in our comprehensive digital marketing library to help improve the commercial results from their marketing. When you are signed in as a Free member you can access free sample downloads by accessing each digital marketing toolkit within the member area. For Free members, we recommend these sample resources to help with digital marketing planning. We also have these "need-to-know" guides and checklists are short sample guides to give a taster for the style of our more in-depth advice available for Expert members. They feature the same structure as the 7 Steps guides and highlight some of the main mistakes to avoid when managing these digital marketing activities. Since they're shorter summaries they don't include strategic recommendations, best practice tips or examples. Expert members in over 50 countries manage their marketing use a wider, deeper range of resources including Ebooks, Healthcheck checklists, planning templates, webinars and video tutorials. Our Digital marketing library is a "one-stop-shop" for best practice in digital marketing including in-depth Ebooks, templates and video training courses structured using our RACE Planning Methodology. These resources help our Expert members develop and refine their digital strategies, increase conversion rates and manage all the main digital marketing channels including search, social, email marketing.